You might want to highlight and enlarge the above trade ads, because the small print yields some fascinating insight into Metro's sale strategies during a first turbulent year of sound production. 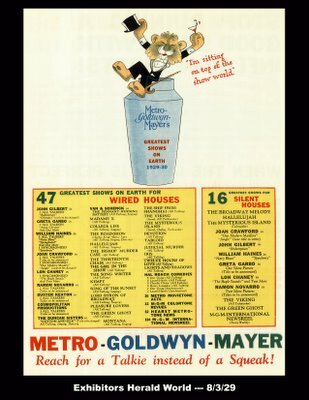 These promotions were designed to herald a coming 1929-30 release season, and the feature page clearly illustrates battle lines now drawn between "wired" and still-silent houses. Exhibitors who couldn't afford the very expensive sound equipment were exerting a lot of pressure for studios to continue providing silent product. 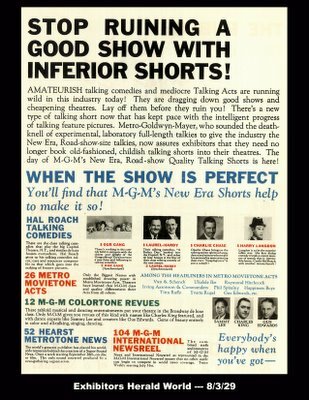 The compromise was to offer silent versions of talking pictures, a generally unsatisfactory solution that left audiences feeling cheated. Metro still had a number of important silent attractions opening throughout 1929 --- Desert Nights, Our Modern Maidens, Speedway --- each of these were available with synchronized music/effects scores on disc. Their final silent feature would be The Kiss, released November 2, 1929. As for silent versions of talking pictures, we can imagine the frustration of watching The Broadway Melody in such a presentation, yet many audiences did, many small-town and rural patrons seeing the groundbreaking musical sans music. 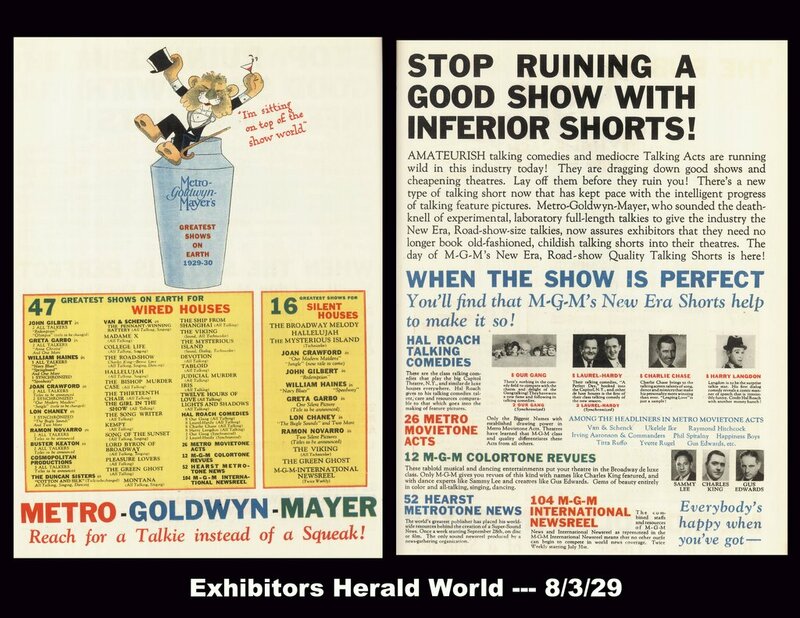 Exhibitors complained that so-called "silent" versions were merely the same prints used for talkie presentations, minus the discs. 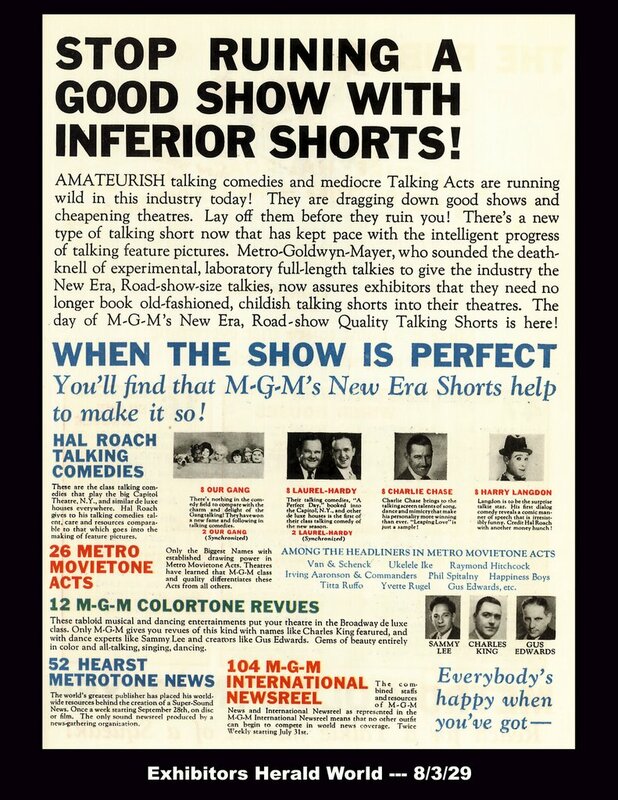 With no intertitles, and of course no sound, think of confusion that would attend a screening of such hybrids.